An artist by training, Dr. Peppler is an Associate Professor of Learning Sciences and engages in research that focuses on the intersection of arts, computational technologies and interest-driven learning. In addition to serving as the Director of the Creativity Labs, Dr. Peppler is the Chief Learning Officer at Collective Shift/LRNG, the former lead of the MacArthur Foundation’s Make-to-Learn initiative, and a member of the 2016 and 2017 National Educational Technology Plan Committee, sponsored by the U.S. Department of Education. Peppler was on the original NSF-sponsored Scratch team during the initial design and early study of the Scratch platform. Since this time, she has specialized in studying e-textile design with the LilyPad Arduino. Dr. Peppler is the recipient of several recent awards, including Mira Tech Educator of the Year and an NSF Early CAREER recipient, as well as grants from the Spencer Foundation, Moore Foundation, and MacArthur Foundation, among others. Through this support, she has authored over 100 peer-reviewed publications, including the authoring or editing of more than 11 book publications. The most recent volumes include the Makeology series as well as the The SAGE Encyclopedia of Out-of-School Learning. Her current scholarly interests include theorizing how changing the tools and materials in today’s learning environments can help broaden participation in STEM, particularly among women and minority populations, as well as improve overall learning outcomes. 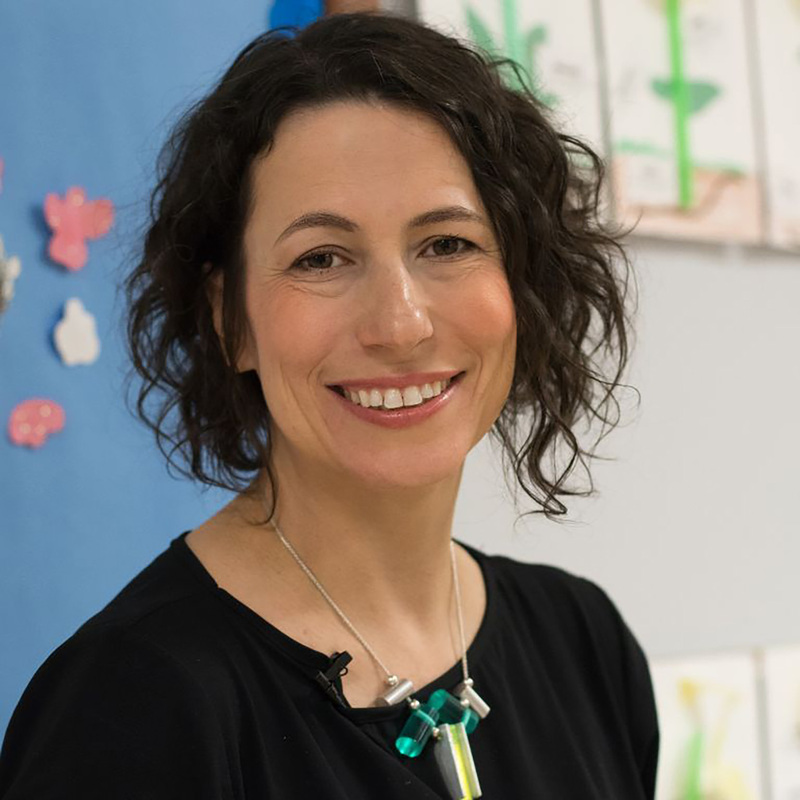 Kylie Peppler is one of 10 Women Championing Connected Learning, honored during Women's History Month by Digital Media + Learning. Follow the link to DML Central to see her video and those of her distinguished colleagues! Dr. Kylie Peppler, Indiana University School of Education, is incorporating artistic creativity into STEM fields immersion. In this video, Peppler explains how she has worked to understand the connection between arts and technology in learning and how her work is essential in attracting children, especially girls, into STEM fields. For a sortable list of work related to my research interests, please see the publications section of this website. As Director of the Creativity Labs at Indiana University (www.creativitylabs.com), I bring together educators, designers, artists, and learning theorists interested in constructionist and hands-on, design-based learning. The lab focuses on computational tools and materials that support learning by leveraging youths’ interests in digital culture, design, and making. Much of my current thinking around making and interest-driven learning is highlighted in my report for the Wallace Foundation, New Opportunities for Interest-Driven Arts Learning in a Digital Age (2013), which showcases how today’s youth learn on their own time and according to their own interests through digital production tools and social media. I also collaboratively designed curricula with the National Writing Project—a four-volume series called Interconnections: Understanding Systems through Digital Designs (MIT Press)—that investigates how designing digital stories, e-fashion, e-puppetry, and videogames in and out of school can help youth connect to core systems thinking concepts emphasized in the Common Core and Next Generation Science Standards (Peppler, Gresalfi, Salen Tekinbaș, & Santo, 2014; Peppler, Salen Tekinbaș, Gresalfi, & Santo, 2014; Salen Tekinbaș, Gresalfi, Peppler & Santo; Peppler, Santo, Gresalfi, & Salen Tekinbaș, 2014). Understandings from projects like these, in addition to several studies funded to study emerging maker communities by the National Science Foundation, the Wallace Foundation, the Spencer Foundation, the U.S. Department of Education, the John D. and Catherine T. MacArthur Foundation's Digital Media and Learning Initiative, and others have guided my current research. A primary focus of this work is on an emerging community of makers creating computational textiles (or e-textiles)—textile artifacts that are computationally generated or that contain embedded computers like the LilyPad Arduino—which capture youths’ pre-existing interests in new media, fashion, and design while supporting learning and creativity in computer science, arts, design, and engineering. My recent research findings indicate that introducing such novel, cross-disciplinary technologies can broaden participation, particularly by women as well as improve learning outcomes (Buechley, Peppler, Eisenberg, & Kafai, 2013; Peppler, 2014). While the major focus of my work is studying how new technologies support learning, I also design new learning environments and educational applications. Most notable of these design efforts is BioSim, a participatory simulation enhanced with e-puppetry that provides a context for classroom teachers to enable embodied, first person explorations of complex biological systems (Danish, Peppler, Phelps, & Washington, 2011; Peppler, Danish, Zaitlen, Glosson, Jacobs, & Phelps, 2010). These pilot designs have been featured in a host of Do-It-Yourself (DIY) outlets, including Craftzine.com, Instructables.com and MAKE magazine and have won numerous awards within these communities. During my postdoctoral research position with Dr. Mark Warschauer, we collaboratively investigated the utility of the Scratch visual programming environment for non-dominant learners. Together, we found this to be a highly motivating introduction to computer programming for children who would otherwise not engage with this important practice (Peppler & Warschauer, 2012). In addition to notable benefits for English Language Learners, we found Scratch to be an effective tool to foster traditional literacy development for students with a range of disabilities but particularly those with cognitive disabilities. A natural extension of my arts background came through my work with Dr. James Catterall at UCLA, where I investigated the nature of arts learning in several notable projects funded by the Ford Foundation as well as the US Department of Education. In this work, we explored how childrens' creativity and worldview was positively impacted by High-Quality Visual Arts Education (HQVAE). We also worked to create new measures for a range of arts learning, as well as document and evaluate rich models of arts education. Seeking to forge an understanding of how new technologies are transforming the arts, I began working with with Dr. Yasmin Kafai and Dr. Mitchel Resnick on the NSF-sponsored development and early study of the visual programming language, Scratch (scratch.mit.edu). Scratch was developed specifically for marginalized youth to develop fluency with computational technologies. What this mediated interface provides for youth (and what makes it fundamentally different from other programming languages) is an emphasis on media manipulation, which supports programming activities that resonate with the interests of youth, such as creating animated stories, games, and interactive presentations (Peppler, 2010; Kafai & Peppler, 2011; Peppler, Warschauer, & Diazgranados, 2010; Peppler & Kafai, 2010). My dissertation work, sponsored by a fellowship from the Spencer Foundation, merged my interests in the arts and computational technology to examine into the ways in which a community of under-represented youth at a Computer Clubhouse (Kafai, Peppler, & Chapman, 2009) in South Los Angeles cultivated deep learning of core computer science and media arts concepts in Scratch (Peppler, 2007). This research was one of the first to assert that this type of learning in the arts and computer science can occur in informal learning communities (Maloney, Peppler, Kafai, Resnick, & Rusk, 2008a; Peppler & Kafai, in preparation). I have since written extensively to the arts and computer science education audiences on this subject, calling for curricula to focus on the “new fundamentals” of computer programming in the arts education curriculum (Peppler, 2010a/b). Such initiatives blend the arts with computation (a foundational concept of computer science and engineering fields). The online Scratch community has since grown to showcase millions of projects and the design work for Scratch was awarded the Eliot Pearson Award for Excellence in Children’s Media in 2008 and an Honorable Mention in the Digital Communities category of Prix Ars Electronica (one of the most distinguished awards in new media), in which my contribution to the early work on Scratch was recognized. For a full list of projects, please visit the Creativity Labs website. This study capitalizes upon the alignment between participatory simulations and the play activities of young children, who are already apt to explore topics of interest to them through play-acting and games. Engaging students in mathematical thinking through hands-on crafts, leveraging new tangible manipulatives as objects-to-think-with in mathematics education. Capitalizing on youths’ pre-existing interests in new media, fashion, and design, this project encourages youth to integrate electronic circuits and computer technology with cloth to make fashions, puppets, and more. A social enterprise that works collaboratively with schools, businesses, cities, and community institutions to redesign learning for the 21st century so all youth have the opportunity to succeed. The Maker movement and Do-It-Yourself (DIY) culture celebrates innovation, creativity, and community engagement centered on hands-on creation. A multidisciplinary team composed of computer scientists, artists, and learning scientists from the University of Pennsylvania, MIT and Indiana University are researching how to encourage youth (ages 10-18) to creatively engage with computational textiles in afterschool and school settings. Computational textiles-textile artifacts that are computationally generated or that contain embedded computers-can capture youths’ pre-existing interests in new media, fashion, and design while supporting learning and creativity in computer science, arts, design, and engineering. This project presents a novel opportunity to study creativity within an emergent IT field (i.e., computational textiles and their applications) and will contribute to creativity research by providing empirically validated accounts of the system nature of creativity captured in interactions between individual designers and community feedback. Furthermore, we are developing tools for how to tailor programming to support 3D textile design, investigating an online community for sharing and validating creative computational textile designs, and discovering learning approaches for workshop models to support computational textiles design with novice programmers. Most recently, projects have been or currently are being completed with preschoolers in a study known as "Squishy Circuits," with girl scouts to study the importance of planning in computational textiles, and with girls and boys clubs to explore gender differences in kit testing. Textile Messages focuses on the emerging field of electronic textiles, or e-textiles—computers that can be soft, colorful, approachable, and beautiful. E-textiles are articles of clothing, home furnishings, or architectures that include embedded computational and electronic elements. This volume introduces a collection of tools that enable novices—including educators, hobbyists, and youth designers—to create and learn with e-textiles. It then examines how these tools are reshaping technology education—and DIY practices—across the K–16 spectrum, presenting examples of the ways in which educators, researchers, designers, and young people are employing them to build new technology, new curricula, and new creative communities. The ReCrafting Mathematics Education (RCM) project highlights new ways to engage students and educators in mathematical thinking through hands-on crafts, an approach that leverages new tangible manipulatives as objects-to-think-with in mathematics education. Our primary focus is on traditional crafts like textile, fiber, and needlework as we believe this research will lead to crucial advancements needed in math education. Many of today’s tangible manipulatives (typically found in early childhood and early elementary) are rooted in blocks and other objects that children snap, construct, or otherwise build with to get a sense of shape, volume, or quantity, including cuisenaire rods, tangrams, Legos, and so forth. But these materials support early understanding of mathematics and are less able to support engagement in more advanced mathematics. Therefore we have chosen to purposefully target traditional textiles, fiber, and needlework crafts to address this twofold gap in tangible manipulatives to (a) have new materials rooted in traditional women’s practices (and coded as “feminine”), as well as (b) have high utility in advanced mathematics. There is significant evidence that crafting practices can offer deep insight into mathematical ideas; as an example, in the early nineteenth century mathematicians became aware of another space called the hyperbolic plane. Although the properties of this space were known for 200 years, it was only in 1997 that Cornell mathematician Daina Taimina worked out how to make physical models of it, using crochet (Wertheim, 2005). The importance of hands-on, interest-driven learning and the value of community and sense-of-belonging are often overlooked in the creation of new learning environments. In addition, math instruction suffers from an over-reliance on abstract and hypothetical problem solving that does not connect the mathematical concepts to meaningful, real-world relevance. One of the reasons the ReCrafting Mathematics Education project was started was to explore the many possible connections between math and craft and to revolutionize mathematics instruction to bring interest-driven learning to the curriculum. Complex systems are widespread and the conceptual ability to describe and examine complex-systems-related concepts is generative, supporting youth in potentially understanding a wide range of issues across domains. BioSim, a participatory simulation where young students (grades K-3) enact the roles of honeybees and army ants within their unique biological systems through the assistance of electronically-enhanced e-puppets, is designed to enhance youths’ understanding of complex systems though novel combinations of play, reflection, interaction and exploration. The BioSim e-puppets allow students to engage in games and simulations where they take on the role of a biological agent such as a bee or an ant, attempting to gather food for the colony. Within a game-like context they then pursue a goal while responding to feedback from the puppet such as a light that indicates how much energy they have left. The idea is that by “being the organism” in this way, students gain a unique perspective on the challenges that insects face. In 2016, the team developed an indoor positioning system so unique it warranted a patent. For more, see the following news releases on this project at newsinfo.iu.edu and IU's Crimson Catalyst Blog. LRNG is funded in part by the John D. and Catherine T. MacArthur Foundation. LRNG is a movement that closes the opportunity gap and transforms how young people access and experience learning and the paths they can take to success. Using technology to connect partnerships and learning opportunities both locally and globally, LRNG holds the promise of delivering immediate, transformative change to the millions of youth who are locked out of traditional paths to success. LRNG will strategically scale up nationwide to close the nation’s opportunity gap and ensure all young people can develop their full potential in life and work. LRNG works with national and local content partners to create learning Playlists that support high-demand academic and workplace skills. Young people who complete a Playlist earn digital badges to document their learning. Parents, teachers, and Makers from diverse walks of life embrace hands-on learning and creativity, but well-grounded and shared understanding of its educational value is still lacking. Make-to-Learn is an effort that leverages DIY culture, digital practices, and educational research to advocate for placing making, creating, and designing at the core of educational practice. Recognizing and articulating the powerful learning potential of making and DIY culture is critical in broadening the reach of the Maker movement and in making programs centered on innovation, creativity, and inquiry more accessible and appealing to educators and youth in under-resourced settings. The broader vision of Make-to-Learn is an educational ecosystem that incorporates these practices as a means to engage and inspire all young people towards lifelong collaborative learning, experimentation, and invention. Through our investigations we will develop a guiding philosophy of what constitutes an open and decentralized lifetime portfolio system for makers, with the goal of developing a portfolio system that can be created and managed by any student/maker; aggregated by schools, community organizations, and informal learning institutions; and be independent of any single website or software. We hope to revisit the utility of portfolios as a central tool for lifelong learning and as a viable alternative to current assessment practices. A collaborative effort between partners of the Maker Education initiative and the Creativity Labs at Indiana University, the Open Portfolio Project is funded by the Moore Foundation. Huang, J., Peppler, K. (2019). Studying computational thinking through collaborative design activities with Scratch. Poster to be presented at the 13th International Conference on Computer Supported Collaborative Learning (CSCL), June 2019. Lyon, France: International Society of the Learning Sciences. Keune, A., Peppler, K. , & Wohlwend, K. (just accepted, 2019). Recognition in makerspaces: Supporting opportunities for women to “make” a STEM career. Computers and Human Behavior. Keune, A. & Peppler, K. (2019). Child-material computing: Material collaboration in fiber crafts. In K. Lund, E. Lavoué, G. P. Niccolai (Eds. ), A wide lens: Combining embodied, enactive, extended, and embedded learning in collaborative settings. 13th International Conference on Computer Supported Collaborative Learning (CSCL), June 2019. Lyon, France: International Society of the Learning Sciences. Law, N., Zhang, J., & Peppler, K. (In preparation, 2020). Sustainability and scalability of CSCL. In the International handbook of computer-supported collaborative learning. Peppler. K. & Keune, A. (2019). “It helps create and enhance a community”: Youth motivations for making portfolios [Special Issue]. Mind, Culture, and Activity: Young People, Digital Mediation, and Transformative Agency. Peppler, K., Danish, J., Thompson, N. (2019). Exploring disciplinary boundaries in early elementary students’ developing practices. Paper to be presented at the 13th International Conference of Computer Supported Collaborative Learning (CSCL), June 2019. Lyon, France: International Society of the Learning Sciences. Peppler, K., Sedas, M., Keune, A, Uttamchandani, S. (2019). Balancing the scales: Implications of model size for mathematical engagement. Poster to be presented at the 13th International Conference on Computer Supported Collaborative Learning (CSCL), June 2019. Lyon, France: International Society of the Learning Sciences. Phonethibsavads, A., Peppler, K., & Bender, S. (Forthcoming). Utilizing the consensual assessment technique to compare creativity in drama spaces. Creativity: Theories-Research-Applications. Keune, A., Wohlwend, K., & Peppler, K. (2019). "We need it loud": Listening to preschool making from mediated and materialist perspectives. In M. Sakr & J. Osgood Postdevelopmental Approaches to Early Childhood Art,, Ch.9, pp.177. London, UK: Bloomsbury. Hive Research Lab. (2018). Brokering youth pathways: A toolkit for connecting youth to future opportunity. New York, NY: Hive Research Lab. Santo, R., Ching, D., Peppler, K., & Hoadley, C. (2018). Messy, sprawling and open: Research-practice partnership methodologies for working in distributed inter-organizational networks. In B. Bevan & W. R. Penuel (Eds. ), Connecting research and practice for educational improvement: Ethical and equitable approaches. New York, NY: Routledge. Banks, T., Wallace, S., Searcy, J., Sedas, M., Peppler, K. (2017). Design Math: A Design and Project-based Effort to Learn Geometry in Middle School through Fabric-Based Yurts . 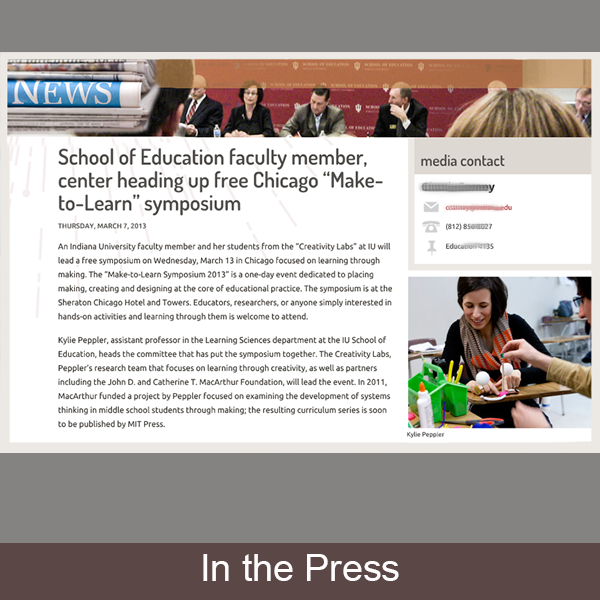 Paper presented at the fifth annual FabLearn Conference: Creating a Sustainable Ecosystem for Making in Education. Palo Alto, CA: Stanford University. Bender, S. & Peppler, K. (2017). Krump culture. In K. Peppler (Ed.) The SAGE Encyclopedia of out-of-school learning (pp. 403-404). Los Angeles, CA: Sage Publications. Bender, S. & Peppler, K. (2017). Makerspaces. In K. Peppler (Ed.) The SAGE Encyclopedia of out-of-school learning (pp. 453-457). Los Angeles, CA: Sage Publications. Chandrasegaran, S., Badam, S.K., Zhou, N., Zhao, Z., Kisselburgh, L., Peppler, K., Elmqvist, N., & Ramani, K. (2017). Merging sketches for creative design exploration: An evaluation of physical and cognitive operations. Accepted paper for GI (Graphics Interface) 2017, Edmonton, Alberta, Canada. Keune, A. & Peppler, K. (2017). Maker portfolios as learning and community-building tools inside and outside makerspaces. Published in the Proceedings of the 2017 Computer Supported Collaborative Learning (CSCL) Conference, pp. 545-548. Philadelphia, PA: International Society of Learning Sciences. Keune, A., Thompson, N. A., Peppler, K. A., & Chang, S. (2017). “My portfolio helps my making”: Motivations and mechanisms for documenting creative projects in out-of-school makerspaces. In L. Mikos & I. Eleá (eds. )Young and creative: Digital technologies empowering children in everyday life, pp. 145-158. Gothenburg, Sweden: Nordicom. Peppler, K. (2017). Creativity in business and technology. In J. C. Kaufman, V. P. Glaveneau, and J. Baer (Eds.) The Cambridge Handbook of Creativity Across Domains. Cambridge, UK: Cambridge University Press. Peppler, K. (Ed.) (2017). The SAGE Encyclopedia of out-of-school learning (Two-volume set). Los Angeles, CA: Sage Publications. Santo, R., Ching, D., Peppler, K., & Hoadley, C. (2017). Participatory knowledge building within research-practice partnerships in education. In SAGE Research Methods Cases - Education. Los Angeles, CA: Sage Publications. Wohlwend, K., Peppler, K., Keune, A., and Thompson, N. (2017). Making sense and nonsense: Comparing mediated discourse and agential realist approaches to materiality in a preschool makerspace. Journal of Early Childhood Literacy 17(3), pp. 444–462. SAGE. Cantrill, C., & Peppler, K. (2016). Connected learning professional development: Production-centered and openly networked teaching communities. In New literacies and teacher learning: Professional development and the digital turn (New Literacies and Digital Epistemologies). New York, NY: Peter Lang Publishing. D'Urzo, S., Foster, J., Keune, A., Peppler, K., & Stutzman, A. (2016). Makerspaces: Providing Pennsylvania practical prefiguration. Techniques, 91(6), pp. 25-27. Peppler, K. (2016). A review of e-textiles in education and society. In Guzzetti, B. & Lesley, M. (Eds. ), Handbook of research on the societal impact of digital media: Ch.11 (pp. 219-241). Hershey, PA: IGI Global. Peppler, K. (2016). ReMaking arts education through physical computing. In Peppler, K., Halverson, E. & Kafai, Y. (Eds.). Makeology: Makers as learners, Vol 2, Ch. 13, pp. 206-226. New York, NY: Routledge. Peppler, K. & Hall, T. (2016). The Make-to-Learn youth contest: Gaining youth perspectives on learning through making. In Peppler, K., Halverson, E. & Kafai, Y. (Eds. ), Makeology: Makerspaces as learning environments , Vol 1, Ch. 10, pp. 141-157. New York, NY: Routledge. Peppler, K., Halverson, E. & Kafai, Y. (Eds.) (2016). Makeology: Makers as learners (Volume 2). New York, NY: Routledge. Santo, R., Ching, D., Peppler, K., & Hoadley, C. (2016). Working in the open: Lessons from open source on building innovation networks in education. On the Horizon, 24(3), pp. 280-295. Wohlwend, K., Keune, A., & Peppler, K. (2016). Design playshop: Preschoolers making, playing, and learning with Squishy Circuits. In Peppler, K., Halverson, E. & Kafai, Y. (Eds. ), Makeology: Makerspaces as learning environments , Vol 1, Ch. 6, pp. 83-96. New York, NY: Routledge. Chien, H., Seehra, J., Verma, A., Peppler, K., Ramani, K., Cheng, Y., Lee, C., and Chierico, A. (2015). Demo hour. In ACM Interactions XXII.3, May-June 2015 (pp. 8–11). Association for Computing Machinery, New York. Ching, D., Santo, R., Hoadley, C., Peppler, K. (2015). On-ramps, lane changes, detours and destinations: Building connected learning pathways in Hive NYC through brokering future learning opportunities. New York, NY: Hive Research Lab. Keune, A., Gomoll, A., and Peppler, K. (2015, September 26-27). Flexibility to learn: Material artifacts in makerspaces. Paper presented at the fifth annual FabLearn Conference: Equity and Diversity in Making. Palo Alto, CA: Stanford University. Kisselburgh, L., Zhou, N., Chandrasegaran, S., Badam, S. K., Elmqvist, N., Peppler, K., & Ramani, K. (2015).Creative collaboration and flow: Validating the use of trace data to measure dynamics of creative flow in collaborative design teams. Published in the proceedings of the 2015 Computer Supported Collaborative Learning (CSCL) Conference, 837-838. Gothenburg, Sweden: International Society of Learning Sciences. Peppler, K. (2015). Tool selection and its impact on collaborative learning In Constructivist Foundations, July 2015; 10(3): pp398-399. Brussels, Belgium: Center Leo Apostel for Interdisciplinary Research. Peppler, K., Catterall, J.S., and Bender, S. (2015). Learning and achieving through the arts: A collaborative project of inner-city arts and Los Angeles Unified School District 4 (Deliverable to the U.S. Department of Education). Bloomington, IN: Indiana University. Seehra, J., Verma, A., Peppler, K., and Ramani, K. (2015). HandiMate: Create and animate using everyday objects as material. In Proceedings of the Ninth International Conference on Tangible, Embedded, and Embodied Interaction (pp. 117-124), New York. Thompson, N., Peppler, K., and Danish, J. (2015, September 26-27). Designing BioSim: Playfully Encouraging Systems Thinking. Paper presented at the fifth annual FabLearn Conference: Equity and Diversity in Making. Palo Alto, CA: Stanford University. Wohlwend, K. and Peppler, K.(2015). All rigor and no play is no way to improve learning. In Phi Delta Kappan, May 2015; 96(8): pp. 22-26. Yoon, S.H., Verma, A., Peppler, K., & Ramani, K. (2015). HandiMate: Exploring a Modular Robotics kit for Animating Crafted Toys. In B. Shapiro, C. Quintana, S. Gilutz, & M. Skov (Eds. ), Proceedings of the 14th annual conference of ACM SIGCHI Interaction Design & Children (IDC 2015). Tufts University, Boston: ACM. Kafai, Y. & Peppler, K. (2014). Transparency reconsidered: Creative, critical, and connected making with e-textiles. In M. Boler & M. Ratto (Eds. ), DIY citizenship (Ch.12, pp.179-188). Cambridge, MA: MIT Press. Peppler, K. (2014). Foreword. In A. Garcia (ed. ), Teaching in the connected learning classroom. Irvine, CA: Digital Media and Learning Research Hub. Peppler, K. (2014). 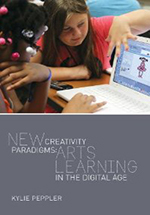 New creativity paradigms: Arts learning in the digital age. New York, NY: Peter Lang Publishing. Peppler, K., Gresalfi, M., Salen Tekinbaș, K. & Santo, R. (2014). 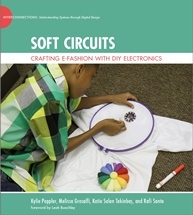 Soft circuits: Crafting e-fashion with DIY electronics. Cambridge, MA: MIT Press. Peppler, K., Salen Tekinbaș, K., Gresalfi, M. & Santo, R. (2014). 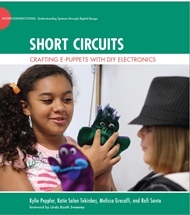 Short circuits: Crafting e-puppets with DIY electronics. Cambridge, MA: MIT Press. Peppler, K., Santo, R., Salen Tekinbaș, K., & Gresalfi, M. (2014). 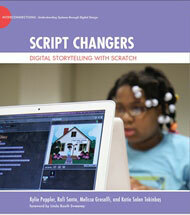 Script changers: Digital storytelling with Scratch. Cambridge, MA: MIT Press. Peppler, K. A., Powell, C. W., Thompson, N., & Catterall, J. (2014, October). Positive impact of arts integration on student academic achievement in English language arts. In The Educational Forum, 78(4), 364-377. Portowitz, A., Peppler, K., Downton, M. & Lichtenstein, O. (2014). In harmony: A technology-based music education program designed to improve children's musical understanding, cognitive skills, and inter-cultural understanding. International Journal of Music Education, 32(2). Salen Tekinbaș, K., Gresalfi, M., Peppler, K., & Santo, R. (2014). 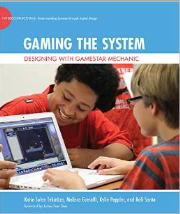 Gaming the system: Designing with Gamestar Mechanic. Cambridge, MA: MIT Press. Sefton-Green, J., Kumpulainen, K., Brennan, K., Mikkola, A., Peppler, K., & Soep, E. (2014). Learning and becoming through making and participatory media. Published in the proceedings of the 2014 International Conference of the Learning Sciences (ICLS), Boulder, CO.
McKay, C. & Peppler, K. (2013). MakerCart: A mobile fab lab for the classroom. Position Paper at the Interaction Design for Children Conference (IDC), New York, NY. Peppler, K. (2013). New opportunities for interest-driven arts learning in a digital age. (Deliverable to the Wallace Foundation). Bloomington, Indiana: Indiana University. Peppler, K. (2013). On screen and onstage: Interest-driven arts for teens. Opera America, Fall 2013, pp. 30-31. Peppler, K. (2013). Social media and creativity. In D. Lemish (Ed. ), Routledge international handbook of children, adolescents, and media (pp. 193-200). New York, NY: Routledge. Peppler, K. (2013). STEAM-powered computing education: Using e-textiles to integrate the arts and STEM. IEEE Computer, September 2013, pp. 38-43. Peppler, K. & Bender, S. (2013). Maker movement spreads innovation one project at a time. Phi Delta Kappan, 95(3), pp. 22-27. Peppler, K.& Danish, J. (2013). 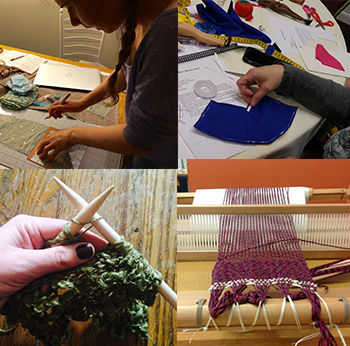 E-textiles for educators: Participatory simulations with e-puppetry. 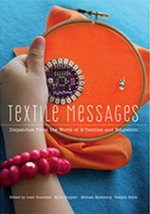 In Textile messages: Dispatches from the world of e-textiles and education (Ch 10, pp. 133-141). New York, NY: Peter Lang Publishing. Peppler, K. & Glosson, D. (2013). Learning about circuitry with e-textiles. In M. Knobel & C. Lankshear (Eds. ), The New Literacies Reader, New York, NY: Peter Lang Publishing. Peppler, K.& Glosson, D. (2013). Learning about circuitry with e-textiles in after-school settings. In Textile messages: Dispatches from the world of e-textiles and education (Ch 5, pp. 71-83).New York, NY: Peter Lang Publishing. Peppler, K. & Glosson, D. (2013). Stitching circuits: Learning about circuitry through e-textile materials. Journal of Science Education and Technology. October 2013, 22(5), pp. 751-763. Peppler, K. & McKay, C. (2013). Broadening participation and issues of inclusion and accessibility in making. Paper at the Interaction Design for Children Conference (IDC), New York, NY. Peppler, K., Sharpe, L., & Glosson, D. (2013). E-textiles and the new fundamentals of fine arts. In Textile messages: Dispatches from the world of e-textiles and education (Ch 8, pp. 107-117). New York, NY: Peter Lang Publishing. Wohlwend, K. & Peppler, K. (2013). Designing with pink technologies and Barbie transmedia. In G. M. Boldt & McArdle, F. (Eds.) Young children, pedagogy and the arts: Ways of seeing (pp. 129-145). New York, NY: Routledge. Downton, M. P., Peppler, K. A., Portowitz, A., Bamberger, J. & Lindsay, E. (2012). Composing pieces for peace: Using Impromptu to build cross-cultural awareness. Visions of Research in Music Education, 20, pp. 1-37. Kafai, Y. B. & Peppler, K. A. (2012). Developing gaming fluencies with Scratch: Realizing game design as an artistic process. In C. Steinkuehler, K. Squire and S. Barab (Eds. ), Games, learning, and society: Learning and meaning in the digital age. New York, NY: Cambridge University Press. Peppler, K. (2012). Scratch: digital art making. ChildArt Magazine, 12(1), Number 42. iv. Danish, J., Peppler, K., Phelps, D. & Washington, D. (2011). Life in the hive: Supporting inquiry into complexity within the zone of proximal development. Journal of Science Education and Technology, 20(5), 454–467. Davis, H., Peppler, K. & Hickey, D. (2011). Assessment assemblage: Advancing portfolio practice through the assessment stage theory. Studies in Art Education, 52(3), pp. 213-224. Downton, M., Peppler, K., & Bamberger, J. (2011). Talking like a composer: Negotiating shared musical compositions using Impromptu. Published In the proceedings of the 2011 Computer-Supported Collaborative Learning (CSCL) Conference. Hong Kong, China. Kafai, Y. & Peppler, K. (2011). Beyond small groups: New opportunities for research in computer-supported collective learning. Published in the proceedings of the 2011 Computer-Supported Collaborative Learning (CSCL) Conference. Hong Kong, China. Kafai, Y. & Peppler, K. (2011). Youth, technology, and DIY: Developing participatory competencies in creative media production. In V. L. Gadsden, S. Wortham, and R. Lukose (Eds. ), Youth cultures, language and literacy. Review of Research in Education, 35(1), pp. 89-119. Peppler, K., Downton, M., Lindsay, E., & Hay, K. (2011). The nirvana effect: Tapping video games to mediate music learning and interest. International Journal of Learning and Media, 3(1), pp. 41-59. Peppler, K., Fields, D., Kafai, Y., & Glosson, D. (2011). Articulating creativity in a new domain: Expert insights from the field of e-textiles. Published in the ACM Cognition & Creativity Conference Proceedings. ACM: Atlanta, GA.
Peppler, K. & Solomou, M. (2011). Building creativity: Collaborative learning and creativity in social media environments. On the Horizon, 19(1), pp. 13-23. Also published in the proceedings of the 2010 International Conference of the Learning Sciences, Chicago, IL. Barab, S., Dodge, T., Ingram-Goble, A., Pettyjohn, P., Peppler, K., Volk, C., Solomou, M. (2010). Pedagogical dramas and transformational play: Narratively-rich games for education. Mind, Culture, and Activity, 17(3), pp. 1-30. Also presented at the International Conference on Interactive Digital Storytelling (ICIDS) 2009, LNCS 5915. Springer-Verlag: Berlin, Germany, pp. 332–335. Danish, J., Peppler, K., & Phelps, D. (2010). BeeSign: Designing to support mediated group inquiry of complex science by early elementary students. Published in the proceedings of the 9th International Conference on Interaction Design and Children, Barcelona, Spain. Downton, M., Peppler, K. & Portowitz, A. (2010). Building tunes block by block: Constructing musical and cross-cultural understanding through Impromptu. Published in the proceedings of the 2010 Constructionism Conference, Paris, France. Horcher, A. M., Peppler, K., & Glosson, D. (2010). E-textiles: The softer side of computing. Published in the proceedings from the 2010 Grace Hopper Celebration of Women in Computing, Atlanta, GA.
Kafai, Y., Peppler, K., Burke, Q., Moore, M., & Glosson, D. (2010). Fröbel’s forgotten gift: Textile construction kits as pathways into play, design and computation. Published in the proceedings of the 9th International Conference on Interaction Design and Children, Barcelona, Spain. Peppler, K. (2010). Media arts: Arts education for a digital age. Teachers College Record, 112(8), 2118–2153. Peppler, K. (2010). The new fundamentals: Introducing computation into arts education. In E. Clapp & M. J. Bellino (Eds.) 20under40: reinventing the arts and arts education for the 21st century, Bloomington, IN: AuthorHouse. Peppler, K., Danish, J., Zaitlen, B., Glosson, D., Jacobs, A., & Phelps, D. (2010). BeeSim: Leveraging wearable computers in participatory simulations with young children. Published in the proceedings of the 9th International Conference on Interaction Design and Children, Barcelona, Spain. Peppler, K. & Davis, H. (2010). Arts and learning: A review of the impact of arts and aesthetics on learning and opportunities for further research. Published in the proceedings of the 2010 International Conference of the Learning Sciences (ICLS), Chicago, IL. Peppler, K. & Kafai, Y. B. (2010). Gaming fluencies: Pathways into a participatory culture in a community design studio. International Journal of Learning and Media, 1(4), pp. 1-14. Peppler, K., Warschauer, M., & Diazgranados, A. (2010). Game critics: Exploring the role of critique in game-design literacies. E-Learning and Digital Media, 7(1), pp. 35-48. Kafai, Y.B., Desai, S., Peppler, K., Chiu, G., & Moya, J. (2009). The multiple roles of mentors. In Kafai, Y.B., Peppler, K., & Chapman, R. (Eds. ), The computer clubhouse: Creativity and constructionism in youth communities, Chapter 8. New York, NY: Teachers College Press. Kafai, Y.B., Peppler, K., & Chapman, R. (Eds.) (2009). The computer clubhouse: Creativity and constructionism in youth communities. New York, NY: Teachers College Press. Kafai, Y.B., Peppler, K., & Chapman, R. (2009). A place for the future. In Kafai, Y.B., Peppler, K., & Chapman, R. (Eds. ), The computer clubhouse: Creativity and constructionism in youth communities, Epilogue. New York, NY: Teachers College Press. Kafai, Y.B., Peppler, K., & Chapman, R. (2009). The computer clubhouse: A place for youth. In Kafai, Y.B., Peppler, K., & Chapman, R. (Eds. ), The computer clubhouse: Creativity and constructionism in youth communities, Introduction. New York, NY: Teachers College Press. Kafai, Y.B., Peppler, K., Chiu, G., Maloney, J., Rusk, N., & Resnick, M. (2009). From Photoshop to programming. In Kafai, Y.B., Peppler, K., & Chapman, R. (Eds. ), The computer clubhouse: Creativity and constructionism in youth communities, Chapter 12. New York, NY: Teachers College Press. Peppler, K. (2009). Evaluation of the Inner-City Arts Teachers’ Institute. (Deliverable to the Heller Foundation). Los Angeles, CA: University of California. Peppler, K. & Alvarez, M. (2009). Evaluation of the Inner-City Arts Creativity in the Classroom Series. (Deliverable to the Heller Foundation). Los Angeles, CA: University of California. Peppler, K., Catterall, J. & Feilen, K. (2009). Arts in the middle: A collaborative project of Inner-City Arts and Los Angeles Unified School District 4 (Deliverable to the U.S. Department of Education). Bloomington, IN: Indiana University. Peppler, K., Chapman, R. & Kafai, Y.B. (2009). Perspectives from the field: It takes a village to raise a clubhouse. In Kafai, Y.B., Peppler, K., & Chapman, R. (Eds. ), The computer clubhouse: Creativity and constructionism in youth communities, Chapter 3. New York, NY: Teachers College Press. Peppler, K. & Kafai, Y. (2009). Creative coding: Programming for personal expression. Published in the proceedings of the 8th International Conference on Computer Supported Collaborative Learning (CSCL), Rhodes, Greece. Peppler, K. & Kafai, Y.B. (2009). Making games, art, and animations with Scratch. In Kafai, Y.B., Peppler, K., & Chapman, R. (Eds. ), The computer clubhouse: Creativity and constructionism in youth communities, Chapter 4. New York, NY: Teachers College Press. Peppler, K. & Kafai, Y.B. (2009). Video production and dance performances. In Kafai, Y.B., Peppler, K., & Chapman, R. (Eds. ), The computer clubhouse: Creativity and constructionism in youth communities, Chapter 6. New York, NY: Teachers College Press. Hayes, E., Peppler, K., Kafai, Y., Games, I., Torres, R., ... & Zimmerman, E. (2008). New perspectives on learning through (game) design. Published in the proceedings of the 2008 International Conference of the Learning Sciences (ICLS), Utrecht, Netherlands. Maloney, J., Peppler, K., Kafai, Y.B., Resnick, M. & Rusk, N. (2008b). Media designs with Scratch: What urban youth can learn about programming in a computer clubhouse. Published in the proceedings of the 2008 International Conference of the Learning Sciences (ICLS), Utrecht, Netherlands. Maloney, J., Peppler, K., Kafai, Y. B., Resnick, M. & Rusk, N. (2008a). Programming by choice: Urban youth learning programming with Scratch. Published in the proceedings by the ACM Special Interest Group on Computer Science Education (SIGCSE) conference, Portland, OR. Peppler, K. & Kafai, Y.B. (2008a). Developing a design culture at the computer clubhouse: The role of local practices and mediators. Published in the proceedings of the 2008 International Conference of the Learning Sciences (ICLS), Utrecht, Netherlands. Peppler, K. & Kafai, Y. B. (2008b). Learning from krumping: Collective agency in dance performance cultures. Published in the proceedings of the 2008 International Conference of the Learning Sciences (ICLS), Utrecht, Netherlands. Peppler, K. & Kafai, Y.B. (2008c). New literacies and the learning sciences: A framework for understanding youths’ media arts practices. Published in the proceedings of the 2008 International Conference of the Learning Sciences (ICLS), Utrecht, Netherlands. Peppler, K. & Kafai, Y. (2008d). Youth as media art designers: Workshops for creative codings. Published in the proceedings of the 2008 Interaction Design for Children (IDC) Conference held at Northwestern University, Chicago, IL. Catterall, J.S. & Peppler, K. (2007b). Learning in the visual arts and worldviews of young children: Where self-efficacy and originality meet. In Evaluating the Impact of Arts and Cultural Education: A European and International Research Symposium, Centre Pompidou, Paris. French translation: Catterall, J.S., & Peppler, K. (2007). Initiation aux arts visuels et vision du monde chez les jeunes enfants: quand confiance en son efficacité et originalité se rencontrent. In Symposium européen et international de researche: Évaluer les effets de l’éducation artistique et culturelle (pp. 283-293). Paris: La documentation Française. Kafai, Y., Peppler, K. & Chiu, G. (2007). High tech programmers in low-income communities: Seeding reform in a community technology center. In C. Steinfield, B. Pentland, M. Ackerman, &. N. Contractor (Eds. ), Communities and technologies 2007 (pp. 545-564). New York: Springer. Peppler, K. & Kafai, Y.B. (2007a). Collaboration, computation, and creativity: Media arts practices in urban youth cultures. Published in the proceedings of the 2007 Computer Supported Collaborative Learning (CSCL) Conference held at Rutgers University, New Brunswick, NJ. Peppler, K. & Kafai, Y. B. (2007c). What video game making can teach us about learning and literacy: Alternative pathways into participatory culture. In Akira Baba (Ed. ), Situated Play: Proceedings of the Third International Conference of the Digital Games Research Association (DiGRA) (pp. 369-376). Tokyo, Japan: The University of Tokyo. Barron, B., Kafai, Y., Joseph, D., Pinkard, N., Resnick, M., Martin, C., Schatz, C., Shapiro, B., Millner, A., Peppler, K., Chiu, G. & Desai, S. (2006). Clubs, homes, and online communities as contexts for engaging youth in technological fluency-building activities. Symposium and proceedings published in the 2006 International Conference of the Learning Sciences (pages 1022-1028), Bloomington, IN. Kafai, Y., Peppler, K., Alavez, M. & Ruvalcaba, O. (2006). Seeds of a computer culture: An archival analysis of programming artifacts from a community technology center . Proceedings Published in the 2006 International Conference of the Learning Sciences, Bloomington, IN. Peppler, K. (2006). Ryman Arts 2000-2006: An overview of the program and an assessment of student portfolio work (Deliverable to the Ryman Arts Program). Los Angeles, CA: University of California. Peppler, K. & Catterall, J.S. (2006). Year two findings on the arts learning of children enrolled in the LA’s BEST after school arts program (Deliverable to the LA’s BEST After-School Arts Program). Los Angeles, CA: University of California. Peppler, K. & Kafai, Y. (2006). Creative codings: Investigating cultural, personal, and epistemological connections in media arts programming. Proceedings published in the 2006 International Conference of the Learning Sciences (ICLS), Bloomington, IN. 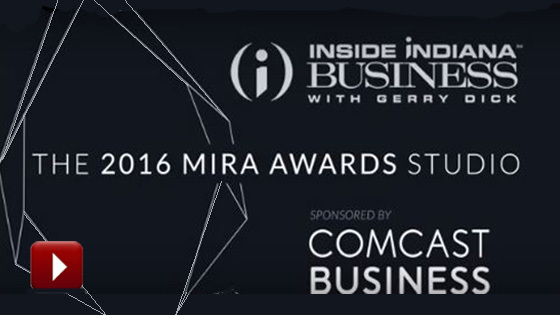 MIRA Tech Educator of the Year (2016) from TechPoint, the growth initiative for Indiana’s tech ecosystem, which honored Indiana’s best companies, entrepreneurs, educators, and other leaders for their technology excellence and innovation during the 17th annual Mira Awards gala. Outstanding Junior Faculty Award from Indiana University (2014). The awards, presented by the Office of the Vice Provost for Research and the Office of the Vice Provost for Faculty and Academic Affairs, honor tenure-track faculty who have begun to develop nationally recognized research or scholarship programs and devoted productive time to teaching and service, but who have not yet achieved tenure. Click the arrow to view a list of my public speaking events. To view my news coverage click the arrow below. 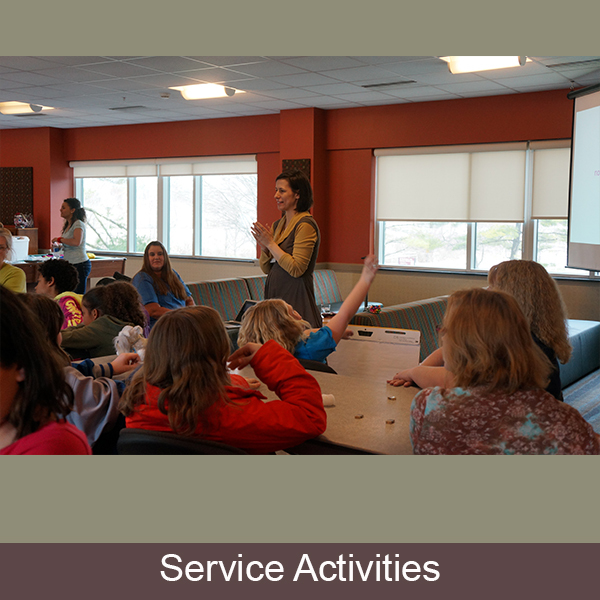 Click the arrow below to learn more about my service activities. Ching, D., Santo, R., Hoadley, C., & Peppler, A. (2017, April). Youth signaling as a means of generating social support around interest-driven learning with technology. Division G–Social Context of Education; Structured Poster presented at the American Educational Research Association (AERA) Annual Meeting, San Antonio, TX. Ching, D., Santo, R., Davis, L.A., Hoadley, C., & Peppler, K. (2017, April). Enacting research-practice partnerships within decentralized organizational networks: A case study of Hive Research Lab and Hive NYC Learning Network. Division G–Social Context of Education; Structured Poster presented at the American Educational Research Association (AERA) Annual Meeting, San Antonio, TX. Danish, J., Peppler, K., Thompson, N., & Thoroughgood, L. (2017, April). BeeSim: Remediating students’ engagement with honeybees collecting nectar from a first- and third-person perspective. SIG-Advanced Technologies for Learning; Paper presented at the American Educational Research Association (AERA) Annual Meeting, San Antonio, TX. Keune, A. & Peppler, K. (2017, April). Open Portfolios: Collaboratively Capturing Rich Learning Through Making. Structured Poster presented at the Annual Meeting of the American Educational Research Association (AERA), San Antonio, TX. Keune, A. & Peppler, K. (2017, April). “You have to make a makerspace”: Material design of an out-of-school tech-center. Poster presented at the Annual Meeting of the American Educational Research Association (AERA), San Antonio, TX. Peppler, K. (March 2, 2017). Research Seminar Series: Make-to-Learn. University of Otago College of Education, Division of Humanities, Dunedin, NZ. Peppler, K. (March 23, 2017). Science Communication Seminar Series: Make to Learn. University of Otago Centre for Science Communication, Dunedin, NZ. Santo, R., Ching, D., Peppler, K., & Hoadley, C. (2017, April). Going further together: A framework for innovation-focused collaborations in informal learning organizations. Division C– Learning and Instructions; Poster presented at the American Educational Research Association (AERA) Annual Meeting, San Antonio, TX. Thompson, N., Bender, S., Keune, A., Peppler, K., Samson, K., Saxena, P., Sedas, M., & Uttamchandani, S. (2017, April). “Good for you math”: Exploring women crafters’ comparisons of “craft math” to “school math.” Division C– Learning and Instructions; Poster presented at the American Educational Research Association (AERA) Annual Meeting, San Antonio, TX. Thompson N., Tan, V., Peppler, K., Wohlwend, K., Thomas, A. (2016, April) Squishing Circuits: Circuitry Learning with Electronics and Playdough in Early Childhood. Poster presented at 2016 Annual Meeting of AERA, Washington DC. Peppler, K. (Chair). (2015). New Tools, New Voices: Innovations in Understanding and Analyzing Life-Wide Ecologies for Youth Interest-Driven Learning. Structured Poster Session at the American Educational Research Association (AERA), Chicago, IL. Peppler, K. (Discussant). (2015). The Maker Movement in Education. Symposium at the American Educational Research Association (AERA), Chicago, IL. Peppler, K. (2015). Using E-Textiles to Integrate the Arts and STEM. Paper presentation at the American Educational Research Association (AERA), Chicago, IL. Peppler, K., Thompson, N., Bender, S., & Wohlwend, K. (2015). "Nothing Really for Girls": Paper presentation at the American Educational Research Association (AERA), Chicago, IL. Examining the Perceived "Genderedness" of Circuitry Learning Tool Kits. Tan, V., Thompson, N., Bender, S., & Peppler, K. (2015). New Tools for Circuitry Learning: Evaluating the Efficacy of Circuitry Construction Kits. Paper presentation at the American Educational Research Association (AERA), Chicago, IL. Wohlwend, K., Peppler, K., & Keune, A. (2015). Design Playshop: Making Spaces for Expansive Learning Through Play, Collaboration, and Playdough "Squishy Circuits." Paper presentation at the American Educational Research Association (AERA), Chicago, IL. Gresalfi, M., Peppler, K., Barnes, J. (2014). Mining Student Designs for Evidence of Systems Thinking. Paper presentation at the American Educational Research Association (AERA), Philadelphia, PA.
Keune, A., McKay, C., & Peppler, K. (2014). Prototype a design workshop for open maker portfolios. World Maker Faire, Bay Area. Kafai, Y., Rusk, N., Burke, Q., Mote, C., Peppler, K., Fields, D., Roque, R., Elinich, K.,Telhan, O., & Magnifico, A. (2014). SYMPOSIUM: Motivating and Broadening Participation: Competitions, Contests, Challenges, and Circles for Supporting STEM Learning. International Conference of the Learning Sciences (ICLS), Boulder, CO.
Kisselburgh, L., Ramani, K. & Peppler, K. (2014). Visually-integrated collaborative ideation: Changing the dynamics of creativity in design teams. International Communication Association Annual Conference, Seattle, WA. Santo, R. & Peppler, K. (2013). Make-to-Learn. Presentation at the 2013 Games, Learning and Society Conference, Madison, WI. Peppler, K., Santo, R., Cloud, J., Rufo-Tepper, R., O’Keefe, D., Midolo, C. & Cantrill, C. (2013). Whole School Approaches to Systems Thinking. Symposium chair at the 2013 American Educational Research Association (AERA) Conference, San Francisco, CA. Shively, K. & Peppler, K. (2013). Judging Creativity in New Digital Art Domains. Paper at the 2013 American Educational Research Association (AERA) Conference, San Francisco, CA. Buccholz, B., Shively, K. & Peppler, K. (2013). The Art of Getting Unstuck: Tinkering to Support Creative Learning in Digital Art Practice. Paper at the 2013 American Educational Research Association (AERA) Conference, San Francisco, CA. Kafai, Y. & Peppler, K. (2013). DIY Beyond the Screen: Creative, Critical, and Connected Making with E-Textiles. Paper at the 2013 American Educational Research Association (AERA) Conference, San Francisco, CA. Peppler, K. (2013). E-Textiles, Physical Computing, and Arts Education “v2k”. Paper at the 2013 American Educational Research Association (AERA) Conference, San Francisco, CA. Eidman-Aadahl, E., Peppler, K., Resnick, M., & Thomas, A. M. (2013). Broadening Participation in Maker Communities. Presentation at the Digital Media and Learning Conference, April 2013. Chicago, IL. Peppler, K. (2012). Computational Textiles as Materials for Creativity. Un-poster presentation at the Computing Education for the 21st Century (CE21) Conference. January 6, Washington DC. Peppler, K., Kafai, Y., Fields, D., Eisenberg, M., Buechley, L., Searle, K., & Hsi, S. (2012). Tinkering with Tangibles: Electronic Textiles in Classrooms, Colleges, and Clubs. Symposium at the 2012 Digital Media and Learning Conference, March 1-3 in San Francisco, CA. Peppler, K., Gresalfi, M., Shute, V., Salen, K., Pinkard, N., Siyahhan, S. & Santo, R. (2012). Seeing the Bigger Picture: Supporting Systems Thinking through Designing Digital Systems. Symposium at the 2012 American Educational Research Association (AERA) Conference, Vancouver, Canada. Peppler, K., Santo, R., Downton, M., Glosson, D., Shively, K., & Volk, C. (2012). New Opportunities for Interest-Driven Arts Learning in a Digital Age. Paper presented at the 2012 American Educational Research Association (AERA) Conference, Vancouver, Canada. Downton, M., Peppler, K. & Bamberger, J. (2012). Emerging Musical Sense-Making: Constructionism and collaboration in computer-aided music composition. Paper presented at the 2012 American Educational Research Association (AERA) Conference, Vancouver, Canada. Wohlwend, K. & Peppler, K. (2012). Pink Technologies and Playful Pedagogies: Gender, Design, and Barbie Transmedia in Digital and Museum Spaces. Paper presented at the 2012 American Educational Research Association (AERA) Conference, Vancouver, Canada. Peppler, K., Berland, M., Santo, R., Danish, J., Phelps, D., Gresalfi, M., & Barnes, J. (2012). Fiddling on the Fly: Thinking, Learning, and Designing Using Board Games. Symposium at the 2012 American Educational Research Association (AERA) Conference, Vancouver, Canada. Peppler, K. & Santo, R. (2012). Informal Learning Environments as 21st Century Pre-Service Learning Spaces for Teachers. Paper presented at the 2012 American Educational Research Association (AERA) Conference, Vancouver, Canada. Kafai, Y., Peppler, K., Buechley, L., Fields, D., Searle, K., Eisenberg, M., Eisenberg, A., Huang, Y., & Danish, J. (2012). Textile Messages: Dispatches from the World of E-Textiles and Education. Symposium at the 2012 American Educational Research Association (AERA) Conference, Vancouver, Canada. Downton, M. P., Peppler, K. A., and Bamberger, J. (2012). Collaborative Meaning Making in Music: Youths’ Discourse During Computer Aided Composition. Paper presented at the 2012 Music Educators National Conference (MENC) Music Creativity Special Research Interest Group. St. Louis, MO. Danish, J., Peppler, K. & Phelps, D. (2011). BeeSign: Designing to Support Mediated Group Inquiry of Complex Science by Early Elementary Students. Paper presented at the 2011 American Educational Research Association (AERA) Conference. Downton, M. & Peppler, K. (2011). Pieces for Peace: Using Impromptu to Build Musical and Cross-Cultural Understanding. Paper presented at the 2011 American Educational Research Association (AERA) Conference. Kafai, Y. & Peppler, K. (2011). Interactivity as a Lens on Youths’ Computational Thinking in an Urban Game Design Studio. Paper presented at the 2011 American Educational Research Association (AERA) Conference. Peppler K., Berland, M., Duncan, S., Games, A. and Gresalfi, M. (2011). Fostering Computational Thinking in Games and Gaming Communities. MacArthur Foundation’s Digital Media and Learning Conference, Long Beach, CA. Peppler, K. & Solomou, M. (2011). Building Creativity: Collaborative Learning and Creativity in a Virtual Gaming Environment. Paper presented at the 2011 American Educational Research Association (AERA) Conference. Peppler, K. & Glosson, D. (2011). Here, There and Everywear: Rhizomatic Activity Structures in an online DIY Community of E-Textile Producers. Paper presented at the 2011 American Educational Research Association (AERA) Conference. Horcher, A. M., Peppler, K., & Glosson, D. (2010). E-Textiles in Everyday Things. Workshop at the Grace Hopper Celebration of Women in Computing, Atlanta, GA.
Kafai, Y., Peppler, K., Resnick, M., & Brennan, K. (2010). SCRATCH: Programming for Everyone. Symposium at the Constructionism Conference, Paris, France. Lewin, C., Erstad, O., Peppler, K., Grennhow, C., Crook, C., Naylor, S., Facer, K., Sorensen, B. H., Manchester, H., & Kahr-Hojland, A. (2010). At the interface – building new relations between formal and informal learning. Symposium at the European Conference on Educational Research (ECER), Helsinki, Finland. Peppler, K., Babcock, E., Panganiban, R., & Erickson, I. (2010). Creating Connections and Promoting Networks. Panel at the 2010 Webwise Pre-Conference Events, Denver, CO.
Kafai, Y., Peppler, K., Resnick, M., Fields, D., Brennan, K. & Diazgranados, A. (2010). Cultivating Creativity and Criticality in Schools and After-School Programs with Scratch, for the first Digital Media and Learning Conference in La Jolla, California. Peppler, K., Kafai, Y., Diazgranados, A., Buechley, L., Eisenberg, M. (2010). Computational Textiles as New Media Texts: Digital Media Learning in Youth and DIY Communities, for the first Digital Media and Learning Conference in La Jolla, California. Peppler, K. & Warschauer, M. (2010). Lessons from Brandy: Creative Media Production by a Child with Cognitive (Dis)Abilities. Paper presentation at the American Educational Research Association (AERA), Denver, CO.
Peppler, K., Lindsay, E., Downton, M. & Hay, K. (2010). The Nirvana Effect: Tapping Rhythmic Videogames to Leverage Learning and Motivation. Paper presentation at the American Educational Research Association (AERA), Denver, CO.
Davis, H., Peppler, K. & Hickey, D. (2010). Assessment Assemblage: Advancing Portfolio Practice Through the Assessment Stage Theory. Paper presentation at the American Educational Research Association (AERA), Denver, CO. Davis, H. & Peppler, K. (2010). Voice Portfolios: Artistry in Assessment. Paper presentation at the American Educational Research Association (AERA), Denver, CO.
Feilen, K., Peppler, K. & Catterall, J.S. (2009). Models for Evaluating the Impact School-and Community-Based Arts Programs. Paper presented at the American Evaluation Association (AEA), November 2009. Peppler, K. A., Downton, M. P., and Hay, K. (2009). Turn That Noise Up: How Rock Band© Helps Youth Develop Rhythmic Intuitions. Paper presented at the Society for Music Perception, Cognition, and Research Conference, August, 2009. Peppler, K., Catterall, J., & Feilen, K. (April, 2009). Curtains Up! Revealing the Mechanisms of Transfer Between Drama and Academic English Language Development. Paper presentation at the 2009 American Educational Research Association (AERA), San Diego, CA. Barab, S., Peppler, K., Ingram-Goble, A., Dodge, T., & Solomou, M. (April, 2009). Identity Experiments: Using Narrative-Rich Games to bring Together Personal, Student, and Disciplinary Lifeworlds. Paper presentation at the 2009 American Educational Research Association (AERA), San Diego, CA. Peppler, K., Kafai, Y., Rusk, N., Beals, L., Bers, M., Breslow, G., Chapman, R., Martin, C., Barron, B., Wise, S., Millner, A., Rusk, N., Resnick, M., Cooke, S., Sylvan, E., & Cole, M. (April, 2009). The Computer Clubhouse Learning Model: Learning Inquiry, Collaboration, and the Development of 21st Century Skills in Informal Learning Spaces. Symposium at the 2009 American Educational Research Association (AERA), San Diego, CA. Peppler, K., Warschauer, M. & Diazgranados, A. (April, 2009). Developing a Culture of Critical Game Design in a Second Grade Classroom. Paper presentation at the 2009 American Educational Research Association (AERA), San Diego, CA. Peppler, K., Downton, M. & Hay, K. (April, 2009). Building musical intuitions through video games: A performance analysis of Rock Band in after-school communities. Paper presentation at the 2009 American Educational Research Association (AERA), San Diego, CA. Peppler, K. and Solomou, M. (July, 2008). The Virtual Builder: Scaffolding Creative Production through Game Play. Presentation at the 2008 Games, Learning, and Society (GLS) Conference, Madison, WI. Peppler, K., Hay, K., and Downton, M (July, 2008). The Nirvana Effect: Tapping the Power of Video Games to Leverage Musical Interest. Presentation at the 2008 Games, Learning, and Society (GLS) Conference, Madison, WI. Peppler, K., Diazgranados, A., Kafai, Y., and Fields, D. (July, 2008). Creating a Culture of Critical Game Designers in Elementary Classrooms and Clubs. Presentation at the 2008 Games, Learning, and Society (GLS) Conference, Madison, WI. Peppler, K. (March 2008). Media Arts: Arts Education for the 21st Century. Paper presentation at the 2008 American Educational Research Association (AERA) Conference, New York, NY. Peppler, K. & Kafai, Y. (March 2008). Creative Bytes for the Learning Sciences: The Technical, Creative and Critical Practices of Media Arts Production. Paper presentation at the 2008 American Educational Research Association (AERA) Conference, New York, NY. Peppler, K. & Kafai, Y. (March 2008). Creating A Culture of Design: A Closer Look at Role of Mediation and Local Practices in a Community Technology Center. Paper presentation at the 2008 American Educational Research Association (AERA) Conference, New York, NY. Hayes, E., Peppler, K., Kafai, Y., Games, I., Torres, R., Pinkard, N., Hooper, P., Klopfer, E., Scheintaub, H., Eugene, W., Daily, S., Ancholou, U., Barron, B., Forssell, K., Kennedy, C., Rogers, M., Takeuchi, L., Walter, S. & Zimmerman, E. (March 2008). New Perspectives on Learning Through Design. Symposium at the 2008 American Educational Research Association (AERA) Conference, New York, NY. Steinkuehler, C., Squire, K., Barab, S., Thomas, D., Peppler, K. & Klopfer, E. (March 2008). Games and Participation: Why Games Matter to Educators. Symposium discussant at the 2008 American Educational Research Association (AERA) Conference, New York, NY. Yardi, S., Bruckman, A.S., Druin, A., Jeffries, R., Kafai, Y.B., Peppler, K. (October 2007). Broadening the Field of Computing through a Design-Based HCI Curriculum. Position paper at the Grace Hopper Celebration of Women in Computing 2007, Orlando, FL. Tishler, B., Kirsch, J. & Peppler, K. (October 2007). Partnerships Serving up Arts as the Main Course! NETWORK's conference Arts Education: Building Bridges through Arts Integration and Partnerships, Oakland, CA. Peppler, K. and Kafai, Y.B. (July 2007). What Video Game Making Can Teach Us About Literacy and Learning: Alternative Pathways into the Participatory Culture. Paper presented at the 2007 Games, Learning, & Society (GLS) Conference, Madison, WI. Kafai, Y., Peppler, K., & Chiu, G. (July 2007). High Tech Programmers in Low Income Communities: Seeding Reform in a Community Technology Center. Paper presented at the International Conference on Communities and Technologies held at Michigan State University, East Lansing, MI. Peppler, K. (April 2007). Videogames and Interactive Art: New Genres and a New Era in Media Education. Paper presentation at the 2007 American Educational Research Association (AERA), Chicago, IL. Peppler, K. & Catterall, J.S. (April 2007). Unraveling the Impacts of the Arts: Measuring Learning in the Arts for Cognitive Research, Program Evaluation, and Policy Analysis. Paper presentation at the 2007 American Educational Research Association (AERA), Chicago, IL. Goode, J., Margolis, J., Kafai, Y., Peppler, K. & Chiu, G. (April 2007)‘Beyond Point and Click’: Opportunities and Challenges in Broadening the Participation in Computer Science in Inner-city High Schools and After-school Programs. Symposium at the 2007 American Educational Research Association (AERA), Chicago, IL. Ching, C., Kafai, Y., Barron, B., Davis, A., Peppler, K., Martin, C., Lewis, S., Yardi, S., Perkel, D., Leander, K., Wang, C., Hoadley, C., Honwad, S., & Tamminga, K. (April 2007). Technobiographies: Researching Life Stories with Technology. Interactive Symposium at the 2007 American Educational Research Association (AERA), Chicago, IL. Kafai, Y., Feldon, D., Giang, M., Quintero, M., Fields, D. & Peppler, K. (April 2007). Where in the World is the Science in Whyville? Informal Science in a Multi-User Virtual Community. Symposium at the 2007 American Educational Research Association (AERA), Chicago, IL. Kafai, Y., Desai, S., Peppler, K., Chiu G. & Moya, J. (2007) Mentoring Partnerships in a Community Technology Center: A Constructionist Approach for Fostering Equitable Service Learning. Presentation at the 5th Annual CAFÉ Conference sponsored by the Paulo Freire Institute, University of California, Los Angeles, CA. Catterall, J.S. and Peppler, K. (November 2006). Measuring Learning in the Arts: Lessons learned from Survey, Observation, and Videotape Methodologies. Paper presented as part of a symposium, Measuring the Arts: Quantifying, Evaluating, and Understanding, Symposium presentation at the 2006 American Evaluation Association (AEA) Conference, Portland, OR. Peppler, K., Catterall J.S. and Feilen, K. (November 2006). Towards a Unified Framework: A Model for Evaluating Arts Learning in Music, Drama, Visual Arts, and Dance. Paper presentation at the 2006 American Evaluation Association (AEA) Conference, Portland, OR. Peppler K., Kafai Y., Desai, S. and Chiu, G. (September 2006). Programming Partnerships: A Constructionist Approach to Teaching Computer Programming Through Service Learning. Paper presented at the 2006 Conference on Service Learning in Engineering, Washington D.C. Desai, S., Kafai, Y., Peppler, K., and Chiu, G. (April 2006). What is a Mentizo? A Contructionist Approach to Mentoring. Paper Presentation and abstract published in the 2006 American Educational Research Association (AERA) Conference, San Francisco, CA. Peppler, K. and Kafai Y. (February 2006). Programming with a Purpose: Opening the Back Door to Technology Literacy. Presentation at the 2006 "Thinking Gender" Conference, University of California, Los Angeles, CA. Peppler, K. (2017). CS4ALL/NSF Research and Practice Engagement: Collaborative Design in RPPs. Invited talk at the University of California, Los Angeles. Peppler, K. (2017). Hosted #InfyEdChat on "The importance of arts and design in making and education", Infosys Foundation USA. Peppler, K. (2017). CS4ALL/NSF Research and Practice Engagement: Collaborative Design in RPPs. Invited talk at the DePaul University. Peppler, K. (2016). Invited Presentation for the CS4ALL/NSF Research and Practice Engagement. Peppler, K. (2016). Invited Presentation White House Champions for Computer Science Education. Peppler, K. (June 2016). Introducing LRNG and New Best Buy Wearables Playlists. Presentation to the Best Buy Teen Tech Centers / Computer Clubhouse Network Annual Conference. Peppler, K. (2016). Summer Workshop Faculty, Design-Based Implementation Research Methods Workshop, Boulder, CO.
Peppler, K. (2016). E-Textiles: Broadening Participation and Deepening Learning. Digital Promise Maker Research Seminar. Peppler, K. & Lindsay E. (2016). LRNG Best Buy Workshop at the Yesler Center, Seattle, WA. Peppler, K. (2016). E-Textiles: Broadening Participation and Deepening Learning. University of Illinois Chicago, Learning Sciences Research Institute Talk. Peppler, K. (2016). Google Workshop in Pittsburgh. Peppler, K. (2016). Introducing LRNG. WE Day Toronto, Canada. Peppler, K. (2016). STEM Central Webinar. Peppler, K. (2016). Invited Panel for the Out-of-School Time (OST) SIG at the American Education Research Association. 2016 Annual Meeting of AERA, Washington DC. Peppler, K. (2016). E-Textiles: Broadening Participation and Deepening Learning. Invited Virtual Talk at St. Thomas University. Peppler, K. (January, 2016). E-Textiles: Broadening Participation and Deepening Learning. Invited Talk at Northwestern University. Peppler, K. (January, 2016). Webinar: Connected Learning for Educators with Howard Rheingold. 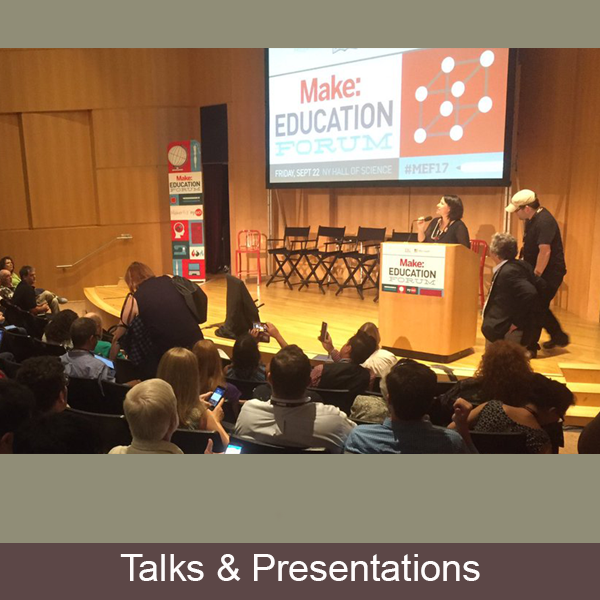 Invited speaker on Maker Education. Peppler, K. (2013). Cultivating Computational Thinking in Youth Communities. Invited presentation at the Korea Foundation for the Advancement of Science and Creativity Conference, Seoul, South Korea. Peppler, K. & Gresalfi, M. (2013). Understanding Systems through eTextile (Puppet) Design. Invited workshop at the National Writing Project Annual Meeting, Boston, MA. Peppler, K. (2013). STEAM-Powered Computing: Arts, crafts, and new media. Invited presentation at CODING AND CREATIVITY: programming, computational thinking and the arts in schools. A policy and practice summit presented by the London Knowledge Lab and D%7CA%7CR%7CE (Institute of Education); the Observer; the RSA; and Creativeworks London. London, UK. Peppler, K. (2013). Broadening Participation through E-Textile Creation. Invited presentation for the Learning Labs convening, Pittsburgh, PA.
Peppler, K. (2013). Make-to-Learn in Libraries. Invited Keynote for the 2013 American Library Association’s Virtual Conference. Peppler, K. (2013). Make-to-Learn in Afterschool Spaces. Build, Create and Innovate: Strategies for Engaging Youth Through Making – Afterschool Alliance webinar. Resnick, M., Brennan, K. & Peppler, K. (2013). Host and participant on “Coding is for Everybody: Learning Through Creating, Personalizing, Sharing, and Reflecting” a month-long webinar on the Connected Learning Network, sponsored by the DML Research Hub. Peppler, K. (2013). The Grinding New Lenses Project: Short Circuits designing with and for educators. Presentation at the NSF Intersections Summer Designs Institute, hosted by the National Writing Project and the Association of Science-Technology Centers, Denver, CO.
Peppler, K. (2013). Textile Messages: Dispatches from the World of E-Textiles and Education. Invited Presentation at the 2013 Mini University, Indiana University, Bloomington, IN. Peppler, K. (2013). New Opportunities for Interest-Driven Arts Learning in a Digital Age. Invited Presentation at the National Guild for Community Arts Education. Chicago, IL. Peppler, K. (2013). Evidence of Interest-Driven Learning in a Digital Age. 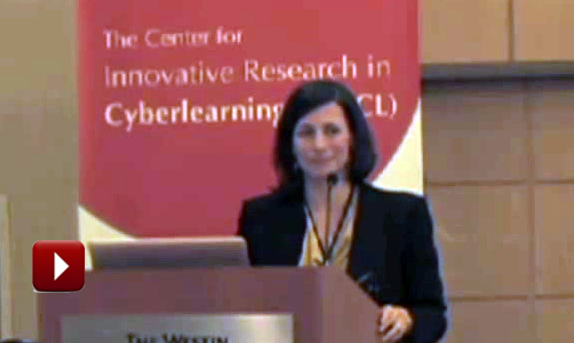 Invited Keynote presentation at the Cyberlearning Synthesis and Envisioning Meeting, June 26-27, 2013. Washington, DC. Peppler, K. (2013). Broadening Participation with E-Textiles. Invited Presentation at the Maker Faire Bay Area on May 18, 2013. Peppler, K. (2013). New Opportunities for Design Research: The Hive Networks and Broader DML Community. Invited presentation at the Connected Learning Research Network meeting, Boston, MA. Peppler, K. (2013). Learning by Making in a Digital Age. Presentation to IUMakes in March, 2013, Bloomington, IN. Peppler, K. & Bender, S. (2013). E-Textile Cuff Workshop for the Girl Scouts of America. November 2013 in Bloomington, IN. Peppler, K. & Bender, S. (2013). E-Textile Cuff Workshop for the Girl Scouts of America. October 2013 in Bloomington, IN. Peppler, K. & Bender, S. (2013). E-Textile Cuff Workshop for the Girl Scouts of America. September 2013 in Bloomington, IN. Peppler, K. & Bender, S. (2013). E-Textile Cuff Workshop for the Girl Scouts of America. May 2013 in Bloomington, IN. Peppler, K. & Bender, S. (2013). E-Textile Cuff Workshop for the Girl Scouts of America. March 2013 in Bloomington, IN. Peppler, K. (2013). Digital Media and Learning Communications Meeting. Held January 31-February 1, 2013 in Chicago, IL. Santo, R. & Peppler, K. (2012) Grinding New Lenses: Seeking coherence in a digital age. Invited workshop at the National Writing Project (NWP) Annual Meeting. Peppler, K. & Santo, R. (2012). Grinding New Lenses Hands-On Workshop. Invited presentation at the National Writing Project (NWP) Annual Meeting. Peppler K. & Bender, S. (2012). Hacking and Making with E-textiles. Invited presentation at the Girls in STEM workshop at Indiana University, Bloomington. Peppler, K. (2012). Interest-Driven Learning. Invited workshop at the LDC Meeting hosted jointly by the John D. and Catherine T. MacArthur Foundation and the Gates Foundation in Chicago, IL. Peppler, K. & Santo, R. (2012). Short Circuits: Crafting with DIY Elecronics. Invited Presentation at the Maker Faire in New York, NY on September 24, 2012. Peppler, K. (2012). Learning and Achieving through the Arts (LATA) Evaluation. Invited talk at Inner-City Arts, Los Angeles on August 28, 2012. Wolfenstein, M., Zimmerman, E., Malaby, T., Halverson, E., Simkins, D., Martin, C. & Peppler, K. (2012). You put your right foot in… Invited session at that Games, Learning, and Society (GLS) conference in Madison, WI on April 15, 2012. Peppler, K. (2012). Evidence of Interest-Driven Arts Learning in a Digital Age. Invited talk by the University of Illinois, Chicago (UIC). Chicago, IL. Peppler, K. (2012). New Opportunities for Interest-Driven Arts Learning in a Digital Age. Invited talk by the National Art Education Association Museum Division Preconference, Metropolitan Museum of Art, New York, NY. Peppler, K. & Eidman-Aadahl, E. (2012). Short Circuits: Scaling with and for teachers. Invited talk at the John D. and Catherine T. MacArthur Foundation in Chicago, IL. Catterall, J. & Peppler, K. (2011). How Arts Rich Environments Impact Achievement. Cleveland Metropolitan School District. Televised Public Broadcast, Cleveland, OH. Peppler, K. & Catterall J. (2011). Assessment Workshop for 20 Premier Arts Specialty Schools (PASS) Teachers. Cleveland, OH. Peppler, K. (2011). Materializing Design Thinking with E-Textiles Education. Invited Talk at the Stanford University REDlab’s Forum on Design Thinking, Palo Alto, CA. Peppler, K. (2011). E-Textiles for Interest-Driven Arts Learning in the Digital Age. Invited Talk at the University of Pennsylvania, Philadelphia, PA.
Peppler, K. (2011). Learning and digital technology. Invited session as part of The Wallace Foundation’s Reimagining the School Day: A Forum on More Time for Learning, held May 16-17 in Washington, D.C.
Peppler, K. (2011). Art, Artifact, and Discourse. Keynote at the keynote talk at the Indiana University Discourse Analysis in Educational Research Conference. Peppler, K. (2011). New Opportunities for Self-Directed Arts Learning in a Digital Age. Invited Talk at the Wallace Foundation, New York. Danish, J., Peppler, K. & Johnson, K. (2011). Invited Panel for the EC Moore Symposium, Indiana University, Indianapolis. Peppler, K. (2011). IN%7CFORMAL learning: Reconceptualizing the divide between in and out-of-school learning practices. Invited presentation at the Indiana University School of Education’s “First Fridays” faculty research seminar. Peppler, K. (2010). E-Textiles: Moving Beyond the Screen. Invited Workshop at the Indiana Women in Computing Conference, Spencer, IN. Peppler, K. (2010). Documenting Learning in the Arts: Opportunities for Research. Invited Presentation at the International School on Mind, Brain and Education (MBE), Ettore Majorana Foundation and Centre for Scientific Culture ,Erice, Siciliy, Italy. Baldwin, T., Haynes, R., Reigeluth, C., Peppler, K. & Stolterman, E. (2010). Invited Key Panel Discussion at the IST Conference on Design and Technology for Teaching, Learning, and Working, Bloomington, IN. Peppler, K. (April, 2009). What exactly are kids learning in Scratch? Observations from the Clubhouse. Invited Presentation, Irvine, CA. Peppler, K. & Kafai, Y. (July, 2008). What exactly are kids learning in Scratch? Observations from the Clubhouse. Invited Presentation at the Scratch@MIT Conference, Boston, MA. Kafai, Y.B., Raessens, J., Copier, M., von Mastrigt, J., Deterding, S., Dubbelman, T., Fields, D., Peppler, K., Renger, W.J., Millenaar, K., Hrehovcsik, M., Ritterfeld, U., Wang, H., & Ratan, R. (June, 2008). Serious Games in the Learning Sciences: Making International Connections. Invited Workshop at the 2008 International Conference of the Learning Sciences (ICLS) held at the University of Utrecht, Utrecht, Netherlands. Kafai, Y., Peppler, K. & Chapman, R. (April, 2008). The Computer Clubhouse Book: A Sneak Preview. Invited Presentation at the Annual Computer Clubhouse Conference Celebrating the 15th Anniversary of the Computer Clubhouse Network, Miami, FL. Peppler, K. (April, 2008). In Dialogue: Links Between Drama and Academic English Language Development of At-Risk Youth. Keynote at the 2008 International Conference Celebrating the 60th Anniversary of the State of Israel, Bar-Ilan University, Israel. Peppler, K. (January, 2008). The Computer Clubhouse Model: Creativity and Constructionism in the After-School Hours. Invited presentation to the Hennepin Library Association, Minneapolis, MN. Peppler, K. (February, 2005). Growing up Gifted. Keynote at the 2005 Indiana Department of Education/Indiana Association for the Gifted Conference, Indianapolis, IN. Featured workshop on E-textiles on the WTIU Friday Zone. Interview for NAVE, Advanced Educational Center, is an integrated education program created by Oi Futuro Institute in partnership with the Pernambuco and Rio de Janeiro (Brazil) State Education Departments. Published in the NAVE newspaper. Blending High- and Low-Tech Worlds with a Maker-Driven Agenda. RiFFs: The expert interview series of the Digital Media and Learning Research Hub. 16 Available at: dmlhub.net/newsroom/expert-interviews/blending-high-andlow-tech-worlds-maker-driven-agenda (last accessed August 28, 2013). Featured in an article in the Lafayette, IN Journal & Courier newspaper on the educational value of smart devices: iPlaytime: More children reaching for smartphones and tablets raises some concern from parents by Taya Flores. Also available online at jconline.com/article/20120109/LIFE/201080323/Sunday-rewindiPlaytime-More-children-reaching-smartphones-tablets-raises-some-concernfrom-parents (Last Accessed January 14, 2012). BeeSim highlighted on fashioningtech blog by Syuzi Pakhychan: fashioningtech.com/profiles/blogs/beesim-interactive-epuppet (Last Accessed March 20, 2012). BeeSim highlighted on Makezine.com: blog.makezine.com/2011/02/16/beesim-game-using-lilypad-and-xbee/ (Last Accessed March 20, 2012). 90-minute interview on Public Television Broadcast in Cleveland, OH, interviewed on the program “How Arts Rich Environments Impact Achievement.“Community Forum event @ Westfield Insurance Studio Theater, Idea Stream at Playhouse Square. National Writing Project Podcast on Exploring “Systems Thinking” with Grinding New Lenses: tinyurl.com/GrindingLensesSummerCamp. This podcast features teachers as well as members of the Indiana University research team sharing and reflecting on the 2011 Chicago summer camp implementation. 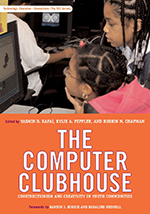 Book Review on The Computer Clubhouse: Curran, C. (2011). Book Review of the Computer Clubhouse: Creativity and Constructionism in Youth Communities. E–Learning and Digital Media, (8)1, p. 86-89. Featured on the Ed Wenck show/WIBC radio in Indianapolis for work on Rhythmic Videogames producing the next prodigy. Technical Working Group, U.S. Department of Education’s National Educational Technology Plan, a leading group of educators, technology innovators, and researchers who reviewed drafts of the guide and provided feedback, writing, and examples captured in the report. Queens 2020 Advisory Board, New York Hall of Science (NYSCI) with the generous support of the Simons Foundation and the STEM Funders Network. Participant, CSCL Workshop: From Data Sharing to Data Mining: A Collaborative Project to Create Cyber-Infrastructure to Support and Improve Design Based Research in the Learning Sciences. Consultant for the Cleveland Metropolitan School District’s Department of Arts Education’s Premier Arts Specialty System (PASS), the district's four K-8 arts infused, and culturally responsive schools in Ohio. Consultant for the Jefferson County Public Schools in Louisville, KY Gheens Academy of Curriculum and Instruction, which designs and supports curriculum throughout a district of 150+ schools. Wonderlab Professional Development for Area Third Grade Teachers. June 2013. Hacking and Making with E-textiles. Invited presentation at the Girls in STEM workshop at Indiana University, Bloomington. Wonderlab Professional Development for Area First Grade Teachers. June 2012. Member, Search Committee for Position in Computer Science and Education, Indiana University.